The Adverbs are coming! The Adverbs are coming! Sorry, I thought I heard one trying to sneak its way into my sentence. We have to be vigilant. The moment you turn your back: BAM! They have you. The barista over there, the one with the ring in her lip, I think she’s with them. I see her glance over here now and then. Her eyes tell me that she knows I’m hiding. Sure, she hides behind that smile of hers, but I know…I know. She’s not the only one, though. Her coworkers chat and they talk about them. I hear it in everything they say. It’s in their laughter, their jokes. They’re doing it on purpose, just to get at me. That’s how they work. You nailed it! I am avoiding this post because I don’t even know how to begin. I’m so with you on this smh! How did you become a Compassion blogger? LOVE them. Honestly, I just signed up. It was pretty easy. 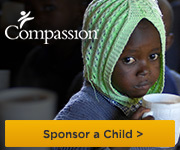 If you want, you can click on the widget at the top of my right side where it says I’m a Compassion Blogger, and it will take you to where you can sign up as well.